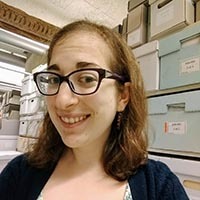 As College Archivist, I work with faculty, staff, students, alumnae to acquire new materials for the Archives, including documents, photos, objects, maps and plans, and digital files. I manage class visits to the Archives and plan our exhibitions and other outreach activities. My colleague Sara Ludovissy and I respond to over 600 research requests each year; we host researchers from all over campus and all over the world. If there's anything you've ever wanted to know about Wellesley history, please ask us!